I must admit, normally I hate the word "jus" - it is pretentious and really, little more than a fancy word for gravy. So I apologise for using it here. In my defence, this isn't really gravy, as gravy to me has some of the juices from the bird or animal roasted and sauce just doesn't seem to quite cut it in this instance. So, pretentious "jus" it is. This was the main course for the husband's birthday meal. I had asked my uncle for inspiration, and he came back to me with a wonderful salmon and cauliflower recipe, but sadly R hates cauliflower so it wasn't to be. 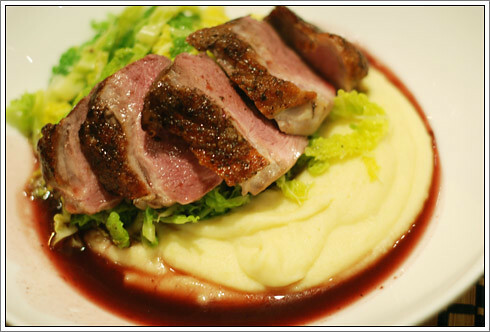 I resorted to an old French bistro classic - duck with savoy cabbage and mash (I later learned that R doesn't much like cabbage either. Fusspot). The beauty of this recipe though, is that it is surprisingly quick to prepare if you've done your prep. I made the sauce in advance and just heated it up when ready to eat, and had the cabbage sliced and potatoes peeled and boiled ready for mashing. If you prepare properly, the dish can be put together in 20 minutes, so it is worth investing a little extra time. Begin by making the red wine and cranberry jus. Add the chicken and beef stock, red wine, thyme, bay leaf and redcurrant jelly to a pan and simmer until reduced by two thirds. season with a little salt and pepper, then strain out the thyme and bay leaf. Set aside until ready to use. Next, make the mash: peel the potatoes and boil for about 20 minutes or so, until tender. While the potatoes are boiling, preheat the oven to 180°C, ready for the duck. Push the potatoes through a potato ricer or mouli - I pushed it through twice, once on a larger setting and then a second time through a fine mesh for a silky smooth mash. Beat in the milk, mustard and butter, then cover and keep warm. Finely slice the cabbage ready for cooking, then score the skin of the duck with a sharp knife and heat a frying pan with a little oil. Fry the duck skin side down for 6-8 minutes dependent on the size of the breast, then flip over and seal the other side for 30 seconds. Place the duck breasts skin side up on a baking tray then roast for a further 6-8 minutes. Once the duck is roasted, remove from the oven, cover with foil and leave to rest for 5 minutes. While the duck is resting, warm through the jus and the mash, place a couple of plates in the still-warm oven to warm up, then melt the oil and butter together in a sauté pan, then add the cabbage and 50ml water and cook for 2-3 minutes, until just tender. To plate up, remove the plates from the oven, place a scoop of mash on the plate, then add the cabbage and then arrange the duck, sliced, neatly on top of the cabbage and carefully pour the jus round the edges of the plate.